On January 21st, the ACS Board of Education heard from appointed Intermediate Principal Melanie Monacelli. She gave an Intermediate Committee update. She said that the committee is in the discussion stages for holding an opening day ceremony for the school and teachers are working on a new school song. Monacelli will have a salary of $110,240.66 per year. The Board had previously voted to re-open the Intermediate School, which was closed due to lowering enrollment. 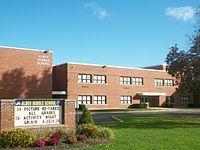 When closed, students in grades 3 were transferred to the Primary School and students in grades 4 and 5 were transferred to the Middle School. The moved meant adding an assistant pricipal to the Middle School. See full story in the January 28th Alden Advertiser.